Look for the answer to your question among these FAQs, and if you are not satisfied, go to the Feedback Board and ask for help. 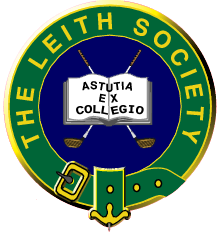 What is the history of the Leith Society?
. Circa 1996: In about 1996 the internet was expanding and many rules discussion groups were attempted, for example by CBS, Golf magazine. One was started from scratch by Grant Spaeth (former presoident of the USGA) and was hoped to be a place where rules officials could discusss mutual issues. The board was called GolfWeb and was moderated by folks such as Richard Davis, Stuart Reid, and David Staebler. Participants included KO Lau, Tessie, and.....It was a tightly moderated board, with deletions of non rules posts frequently deleted by the moderators.
. Circa 1998: About this time, Grant sold the site and its name to the PGA Tour which currently holds the name as a feature of its site. Why are there several discussion boards? Won't one do? They are a vestige of our former site where multiple boards were necessary because there was no archiving available and we like to leave posts around for as long as possible. We ended up with six boards there, divided by rule groups. Here, we have archiving, but the division of boards into general categories allows us to meet our two main objectives: provide a forum for non-rules officials to get answers to their rules questions (the General board), and a place for serious discussion among active referees and officials (the Referee board). The In Depth board provides a place for detailed analysis of many aspects of the rules. Please see the posting guidelines for further information about our posting policy. Where are the archives of the posts that appeared on the "Bravenet" boards? The Bravenet system did not have an archive feature. Some of the contributors manually made copies of the posts and we are working with them to see if we can provide them as a resource as well. We agree that is a shame, but that is one of the reasons we joined forces to create this new site. These posts can be archived. Keep checking the menu and hopefully one day some Bravenet archives will be available. Where are links to the USGA and R&A sites? Links to the home pages of the USGA, R&A are in the main menu under "Ruling Bodies." More direct links to the rules sections of those sites is under "Study Resources." What do the abbreviations in the posts mean? Note: Abbreviatons may occasionally stand for a person's initials, examples: TW - Tiger Woods, JP - John Paramor, HP - Hans Paul Griesser. References, such as R.17-2, refer to Rule 17-2 (Rules of Golf). References, such as D. 18-2a/10, refer to Decision 18-2a/10 (Decisions on the Rules of Golf).